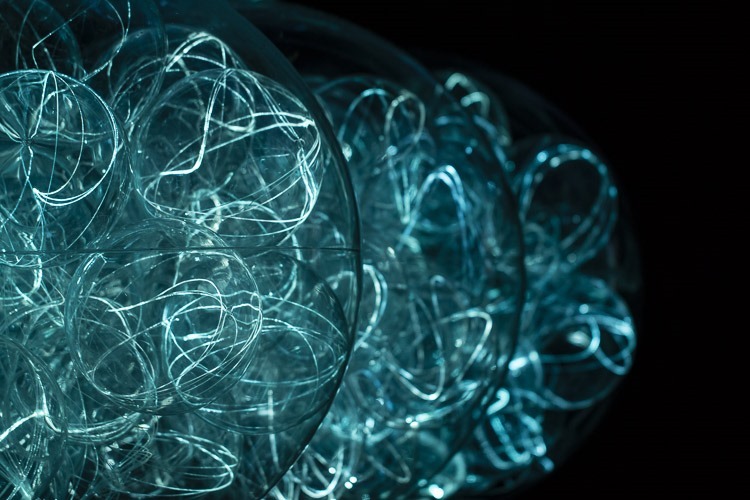 Winter Light: Bruce Munro – Continuing our exploration of light at Waddesdon, we are delighted to be collaborating again with artist Bruce Munro in the gardens. Take a magical journey through six large-scale installations and be mesmerised by shapes, textures and colours. Last year’s exhibition left me feeling pretty cold, and not just because it was 30th November. Several thousand second-hand pre-owned/second-use/recycled CDs nailed to the grass of Waddesdon Manor didn’t really do it for me, especially when one of those “works of light art” could really be seen only from the air. This year, I chose not to accompany Carol but let her go unencumbered to be creative by herself. Let’s face it, I’m an artistic numbskull. She did have some company, though, in the form of our friend, Rosemary, who, I’m sure, was much more appreciative than I’d have been. Having said that, now that I’ve seen Carol’s photographic results I’d say that the eminent Mr Munro seems to have done better this year. Whereas last year there were two exhibits, both of crucified CDs, this year there are six and not a CD in sight. Carol came back with appealing shots of three of the current exhibits. This year’s Brass Monkeys exhibit seems to be derivation of last year’s Blue Moon on a Platter exhibit, based on optical fibres within spheres. And now, the fun. To quote the literature Brass Monkeys takes its name from brass triangles (supposedly the monkeys) used to support cannon balls on board 18th century war ships. The artistic speak continues, “… hence the saying cold enough to freeze the balls of a brass monkey”. The term I’ve heard finishes … off a brass monkey. I’ve never been comfortable with the explanation and here’s what the Oxford English Dictionary has to say on the subject. Time for another quote from the artistic speak. Shown for the first time in the cloister of Salisbury Cathedral, Water Towers is an immersive installation which developed from Munro’s interest in the phenomenon of colour synæsthesia – where colours are perceived as sound. 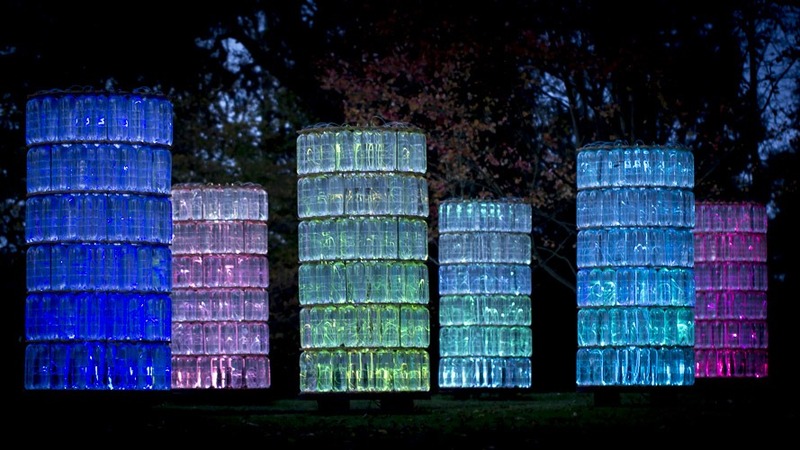 At Waddesdon the installation is 16 structures constructed from 2-litre recyclable plastic water bottles illuminated with optical fibres. This installation beckons people to immerse themselves in the spaces between the towers as they walk through a corridor of light and sound. More education! Synæsthesia is neither a disease nor will it cause people to become unconscious. Further more, immersive has nothing to do with Harry Houdini making a last minute escape from the water towers just before his breath runs out. 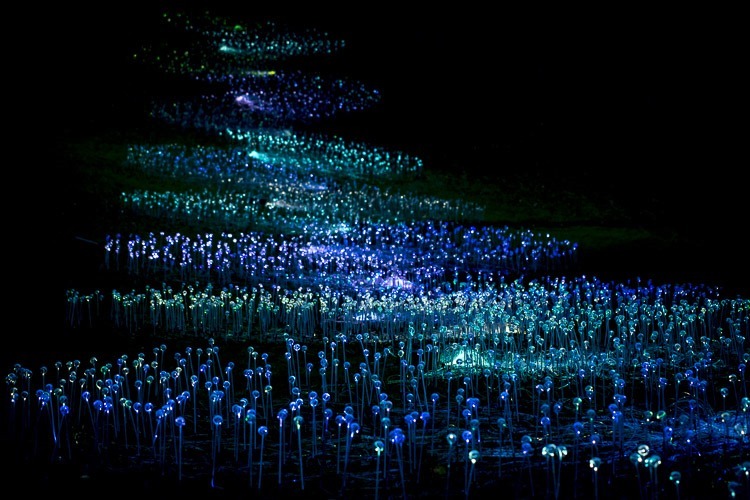 … is a new manifestation of Field of Light, perhaps Munro’s best known work, first seen in 2004 at his home in Wiltshire, and at the V&A and then reworked in different permutations, each created in response to the space in which it is exhibited. So, it isn’t only the plastic bottles that are recyclable, eh? In all honesty, though at first it sounds like cheating, given the nature of these works of art I imagine they pretty much have to be reworked/re-used in order to be displayed elsewhere. At Waddesdon, River of Light, “constructed from 6500 glass spheres each threaded with coiled fibre optics mounted on individual stems”, trickles down Daffodil Valley [my phrase, not the artistic speak]. Of course, the nature of such exhibits is that they really demand darkness, or at least diminished levels of light. Timing is everything and patience may be required to appreciate them. The regular Waddesdon kicking out time of 5:00PM leaves a narrow window opportunity, though it gets wider the closer to 21st December you are. Fortunately, they do have some late evenings to help. No elevated vantage point necessary this year so bravo! This year there seems to be more light than can be generated by condensation-dulled CDs, entirely more interesting. I think River of Light is my personal favourite. I can see why it might be Bruce’s best known work.